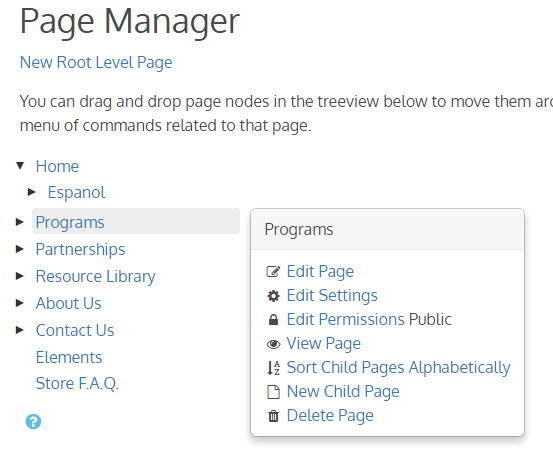 Page Manager Pro makes it easy to manage your site hierarchy. You can drag and drop pages to move them around in the site hierarchy or to change their sort position. The built in page manager in mojoPortal can become unwieldy when your site has hundreds or thousands of pages. Page Manager Pro is intended to solve this problem and make it easier to manage larger site hierarchies. You can also try it out yourself on our demo site demo.mojoportal.com. As with our other add-on products, you get free updates for a year after purchase! After purchasing and downloading the product, extract the zip file. Copy the contents of the dotnet40/wwwroot folder into the root of your website. Do not copy the wwwroot folder itself, copy all the contents and paste them into the root folder of your mojoPortal website and they should all land in the correct location. use whatever color and background-color work well for your design. Requires mojoPortal 2.4.0.9 or higher hosted with ASP.NET 4.5 or higher. 1.0.0.1 released 2014-04-07 fixed bug where pages with & characters in the name were rendered incorrectly. Fixed bug where page edit and settings links could not be right clicked to open them in a new window. Fixed bug where pages marked as not included in the main menu were also filtered out of page tree.